Description: When properly cooked, bean thread goes soft and translucent and picks up the flavours of the cooking liquid. This makes it a unique addition to salads, stews and steak. Stir Fry - Add dry vermicelli to boiling water for 3-5 minutes. Drain. Add the soft vermicelli to other ingredients in wok and stir-fry for 2 minutes, add flavour to taste. Soup Noodles - Add dry vermicelli to boiling water for 3-5 minutes. Drain. Add the soft vermicelli to hot soup on slow heat for 2 more minutes. Add flavour and condiments to taste. 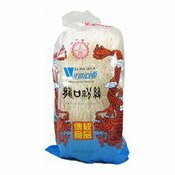 Sala - Add dry vermicelli to boiling water for 4 minutes. Drain. Run under cold water to cool, drain. Mix the soft vermicelli to salad, add flavour and condiments to taste. Ingredients: Ming Bean (95%), Water. 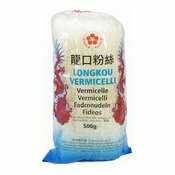 Simply enter your details below and we will send you an e-mail when “Longkou Vermicelli Bean Thread (金梅龍口粉絲)” is back in stock!